This aid places the processor high on the ear and delivers the sound to the ear canal, by way of a thin wire, to a tiny speaker that sits deep inside the ear canal. The devices are phone and bluetooth compatible. This unit is smaller than ITE’s and fits slightly further into the ear canal. ITCs have less bulk in the ear cavity. 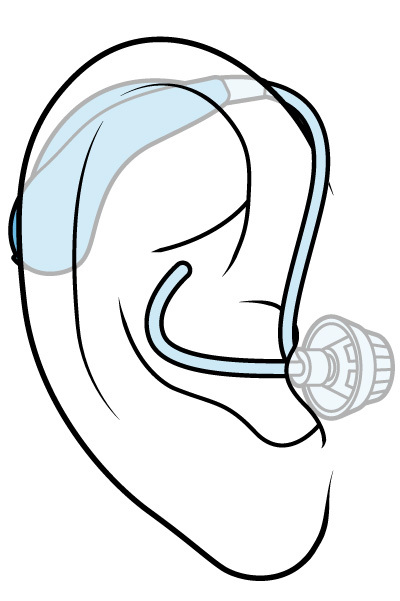 This device is used for mild to moderately severe hearing losses. These devices can accommodate most circuit functions and telephone compatible circuitry. These hearing aids fit further in the ear canal making them barely visible from the front. This device is used for mild to moderately severe hearing losses. Due to size constraints, some circuit functions are not available. The primary difference between the following technology levels is the sophistication of background noise processing and speech enhancement software. The type of technology appropriate for each patient varies depending on hearing loss and communication needs. This tier is the lowest level of technology and is normally the least expensive. Most devices in this category have all iPhone features and bluetooth streaming available. It has the lowest level of background noise and speech enhancement programming. This is considered the “business class” product. Again, all iPhone and bluetooth streaming capabilities are available. It has more sophisticated background noise processing, speech enhancement, and better sound location features. These are the top-of-the-line aids. This model has the highest level of sound location processing, noise reduction, and speech enhancement. (Of course, all iPhone and bluetooth capabilities are available).